Globally, March 22 is the annual World Water Day celebration, the aim is to highlight the importance of water around the world using a variety of events varying from educational, musical, among others. 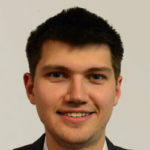 The theme for 2019 World Water Day is “Leave No One Behind”, and it is geared towards encouraging people and organizations to consider the marginalized groups such as People With Disability (PWD), the elderly, women and children and other groups that are often overlooked or discriminated when planning Water, Sanitation and Hygiene (WASH) developments. 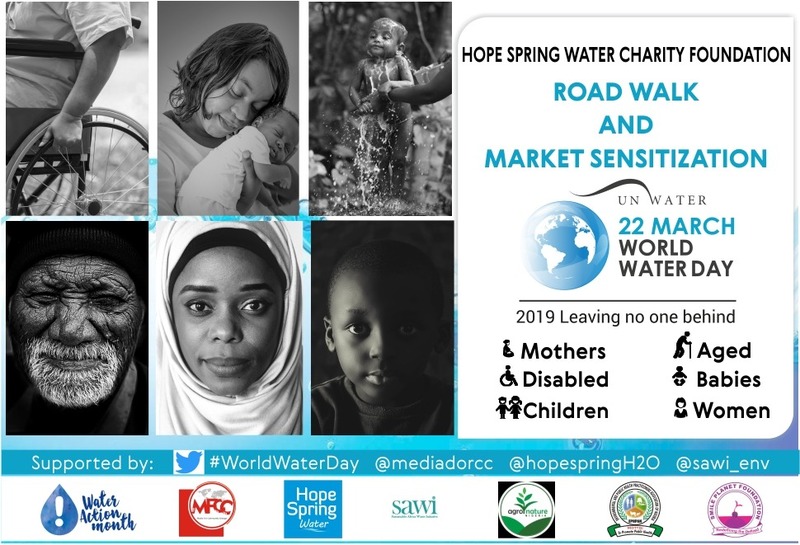 On Friday, March 22, 2019, Hope Spring Water Charity Foundation is partnering with other stakeholders like Sustainable Waste Africa Initiative (SAWI), Media for Community Change (MFCC) in Abuja to take Water, Sanitation and Hygiene (WASH) campaign to major markets to sensitize women and other stakeholders on the need to involve the marginalized people when making plans for Water, Sanitation and Hygiene (WASH). 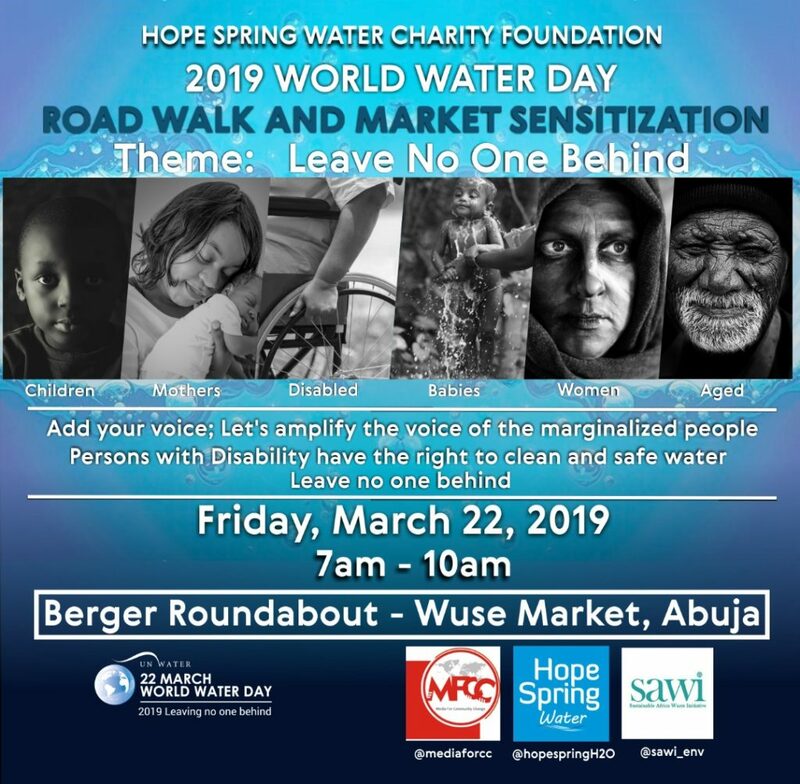 According to the project coordinator, Adesuwa Obasuyi, “Hope Spring Water Charity Foundation has taken it upon itself to mark the World Water Day 2019 by embarking on a Road/Market Walk to amplify the voice of marginalized groups in a quest for inclusive development in the WASH sector”. The Foundation is committed to executing WASH infrastructural and sensitization projects in various parts of Nigeria, among our most recent projects are the drilling of boreholes in extremely local communities within Abuja and the “WASH Run” which brought together over 500 persons across two major states in Nigeria (FCT & Lagos State), and which was carried out in partnership with WaterAid Nigeria, Action Against Hunger, Sustainable Africa Waste Initiative, AimCare Nigeria, Media for Community Change, and Federal Ministry of Water Resources, to spotlight the challenges of water poverty in Nigeria. 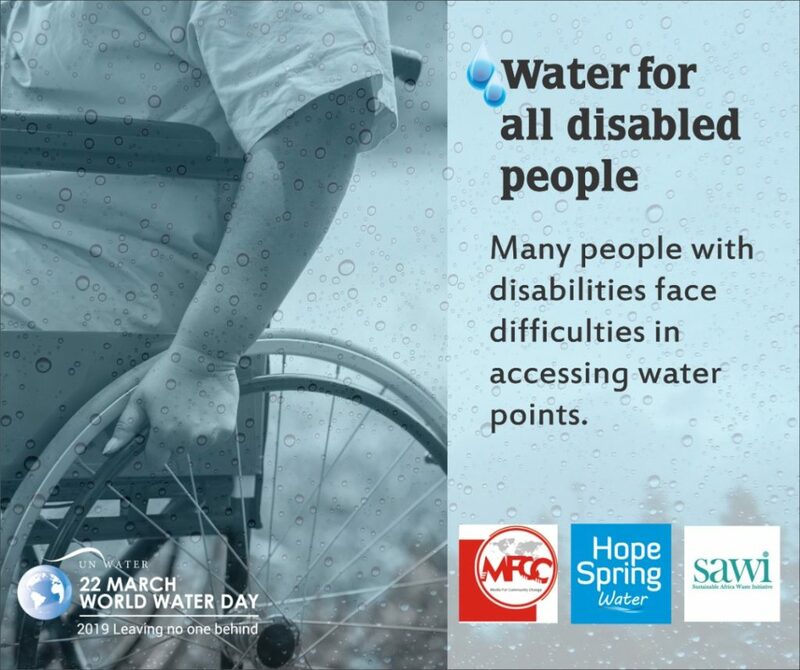 On Friday, March 22, 2019, Hope Spring Water Charity Foundation will build upon the successes of her previous projects to pass across the key message that access to water is a fundamental human right, and no one should be left behind. The walk further aims to highlight water related challenges Nigerians face such as water scarcity, water pollution, inadequate water supply and poor sanitation and hygiene as well as increase commitment from politicians/government to improve the water situation and make it accessible to everyone. 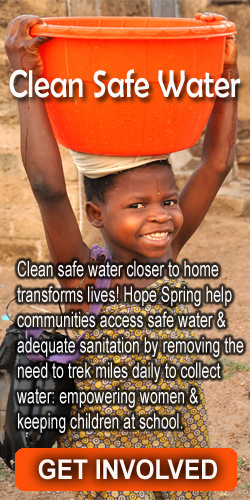 Hope Spring Water’s Country Director, Temple Oraeki, stated that the campaign couldn’t have come at a better time. In his words, “Following recent signing of the disability bill into law, by the Federal Government, the sensitization walk will serve as a call to action for the Government to lead by example in non-discrimination of Persons With Disabilities (PWD) by providing an inclusive WASH facilities across Nigeria.” He called on other NGOs, CSOs, the private sector and other stakeholders in the WASH sector to join the campaign to amplify the voice of the marginalized people and raise awareness on the problems that marginalized people face in getting access to water.